If you asked a business owner what is the most important factor to decide if a website is successful, they will most likely say a high volume of traffic. While a successful website does need to generate large traffic numbers, it is not the most important factor in deciding if a website is successful. What determines the success of a website is its ability to convert visitors into customers. A website with a high conversion rate is an asset because it generates money for a business. Therefore, you need to focus on developing your website to increase its conversions if you want it to become an effective sales tool for your business. 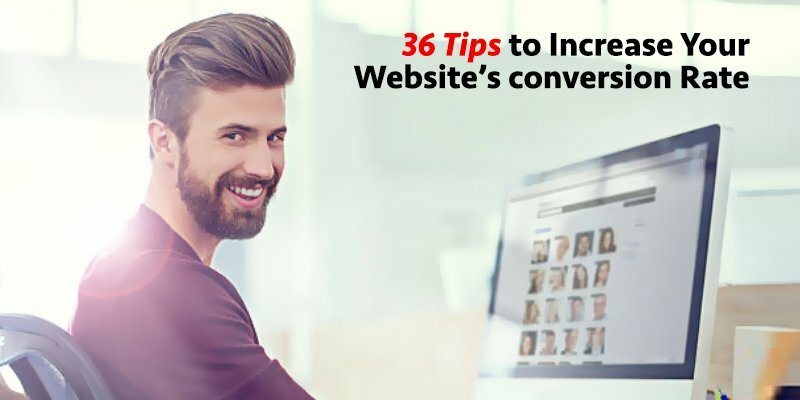 If you need help with increasing your conversions, we have provided 36 tips to help you accomplish your goal. If you are ready to create a website that has a high conversion rate continue to read on. The four factors of any action are an opportunity, ability, incentive, and willpower. Before you can hope to increase the rate at which people take an action on your website, you must understand what causes an action to occur. You will need to know the motivation of your visitors when they visit your website. There is a specific purpose they want to accomplish and you need to know what that exact purpose is so that it can be provided. The purpose of having a website is to convert visitors into customers. This goal cannot be accomplished if you are not directing people to become your customers. You must have call-to-actions throughout your website that encourages people to sign up to your email list, download your free ebook, or take advantage of a sale that is being offered. Never assume visitors on your website know what action they need to take. It is your responsibility to constantly guide them towards the action you want them to take. Landing pages are a great tool to use to increase conversion because they are created specifically to encourage people to take the action it is promoting. Therefore, instead of having one landing page that communicates one message, create multiple landing pages that offer different messages. This will help you capture different segments of your customer base that respond to different messages. The copy on your website and landing pages is the most important element in making sure they are successful. You must provide great content that motivates people to take action. By the time they get a chance to make a purchase or download your offer, they are enthusiastic to follow through based on how well your content sold the value your product or service will provide to the customer. The majority of today’s customers are doing their research for businesses and making their purchases via mobile devices. Therefore, you need to be sure that your website is optimized to convert to mobile devices and function without problems. If this is not the case, you will definitely be missing out on a lot of customers who only use mobile devices to search the internet. Your website needs to run without any defects. If visitors have any troubles while on your website, they will abandon it to never return. All your pages should have great copy, there should not be any broken web links, and your call-to-actions need to be placed evenly throughout your website. When all these steps are achieved, you make it easier to accomplish your goal of converting visitors into customers. Information should not be jumbled together confusing the visitor about what they should be looking at. If this occurs then you seriously diminish your chances of converting people into customers. You need to space out your content, instead of having it so close together. This allows people to focus on one thing at a time, which helps your ability to convert. It might seem like a good idea to offer people 10 options to choose from when it comes to making a purchase, but this only decreases their chances of making a purchase. You need to offer people 3-4 options at most. They can understand what options they have to choose from and think them through more clearly since they do not have so much information to think about. You do not need to intimidate people by requesting they fill out 20 lines of information to receive your offer. Asking for a phone number, home address, and other personal information will be too invasive for most people, so they will turn down your offer as a result of these feelings. All that needs to be filled out is their name and email address (most important). All that should be required from visitors is their name and email address. You need their name to know who they are, and an email address is the best method of selling online. Information such as phone number should be optional — only being required if people prefer to be reached by phone. Adding an optional field helps you collect all important information without turning people away. Your headline is the first piece of content that visitors will read upon landing on your website. Therefore, your headline needs to communicate the value of your content and why people need to continue reading. If you have a weak headline, you will find it very hard to get people to read your entire content. When people read the headline of your content or click on a social media link promoting your content, they expect to read information that feeds their expectations. If this does not occur, they will be highly disappointed and never return to your website because you do not provide results. So, if your content is less than what has been advertised, what does that say about your products or services? Do not make the mistake of creating copy that overly sells, instead of providing value. When you are trying too hard to sell your business it turns people off. You need to be direct with people by telling them exactly what you are offering and why your offer is valuable to their personal life or business. Provide the important information that backs your claims up with facts, rather than with fluff information. You need to be very specific about the value you are providing to your customers by stating the experience they receive from being your customer. If you are not communicating your unique value proposition, you are not giving people a reason to choose your business as the provider of their particular need. You need to make it urgent for people to follow-up on your offer. This cannot be done by using passive language that does not encourage people to take action. Therefore, you need to use words that motivate people to partake in your offer. These words include: “purchase now”, “limited offer”, “while products last”. These words inform people that they need to partake in your offer quickly before others take their opportunity. Your customers do not need to read the language that is used among your peers. They do not care about the technical language that you know. What they care about is your ability to help them resolve a problem or achieve a certain experience that they desire. When you use industry jargon and buzzwords, you make it hard to communicate what they want to know. There will be people who tell you that your content needs to written at a certain length to keep people’s attention. Some will say under 500 words, some will say over 500 words, and others will say over 1,000 words. You need to determine what length works best for your audience so that you can increase your conversions. Most readers do not want to read academic standard writing. They want to read simple words that are easy to follow and clearly communicates the message your content is supposed to convey. You can convert more people when you make it easier for them to understand what you are saying. You need to tell customers how your product or service will improve their life, rather than the features that are being offered. Customers do not care about features. They want to know if your offer can solve the problem they are having. Once you can communicate your benefits in an effective manner, you can convert more interested buyers into customers. Give people a reason to be excited about your offer by being excited yourself. Communicate the experience your current customers have had by purchasing your product. Talk about your product or service will change the customer’s life. Just remember, you want to get people excited but you must deliver on the promises you make. Using buttons is all about creating a psychological effect. When a button is presented, it encourages visitors to click on it because that seems like its natural purpose. When you implement e button feature analyze how well your click through results improve. You want to encourage people to follow through on their purchase or download by making sure your submit button does its job as the final piece to the process. You can do this by enlarging your submit button or making it a distinct color. Whatever choice you make, it needs to compel people to follow through on completing their act. If you sell high priced items, you can encourage people to purchase them by stating the items are being offered at a discount. This makes people feel as if they are getting a better deal and you increase your sales as a result. You will need to use different pricing tactics if you want to increase the amount of product or services you sell. The open space on your website does not only need to be filled with text. You can add images in your spaces because they increase interaction with your visitors. By having images that resonate with the content on your pages, visitors will stay on your website longer. You need images of people on your website if you hope to increase the trust people have for your business. When people see an image of a person smiling back at them, it tells them that your product or service will make them happy. It is best to include images of your actual customers and staff. Consumers tend to enjoy videos more than reading content. This is why YouTube is the second most visited website in the world. You need to provide people with a mixture of written content and video content. You want to show people exciting and encouraging content when they are watching your videos. Your video content should show your product in action or give a behind the scenes look at your business. You need to demonstrate to potential buyers that you have the social proof to back up your authority and experience. Allow people to see how many like you have on Facebook and a number of followers you have on Twitter and Instagram. But. likes and followers mean nothing if you do not have the interaction to back it up. People should be sharing your social media content with others because they view you as an authority in your field. When people see this is happening, they then see that you are the real deal. People need to hear and see the validation of your products or service by existing customers. They need to know their experiences and how your product or service helped them with their particular problem. These need to be authentic reviews and not some paid actors. You want to encourage people to make a purchase by guaranteeing they will see their expected results or get their money back if not. When customers see that you stand behind the value of your product, they will be more inclined to follow through on their purchase. Free trial offers to allow people to try your product out for a certain amount of days, usually no more that 30 days, before they are charged. Offering this free trial opportunity will help you sell more products, especially if your products provide value immediately. People need to know that your offer is only available while supplies last. When this is communicated, you will usually see purchases increase at a higher rate because people want to ensure they experience the value of your product or service — this is if you effectively communicate the value being provided. You will need to have various payment options available for people who use different forms of payment. This means you need to accept PayPal, credit cards, and other payment options so that you do not deny the ability of all people interested in your products or services to become your customers. When people are in the process of making a purchase, make them an offer of a discount so that they will follow through on making their purchase. These discounts can pop-up during different times when they are in the process of checking out their items. You want to do everything possible to ensure the initial purchase request is completed. Word of mouth marketing is still the best form of marketing. There is no better marketing than a customer who is excited about the experience they had with your product or service. The enthusiasm they share with their family and friends encourages them to visit your website for themselves. Your customers are helping you gain more customers. You can encourage customers to buy the products that your other customers have purchased. You need to state these items as being recommended by other customers. There needs to also be reviewed to accompany these recommendations so that it entices people to make the purchase themselves.